Registration For BuskFest 2019 will open soon. 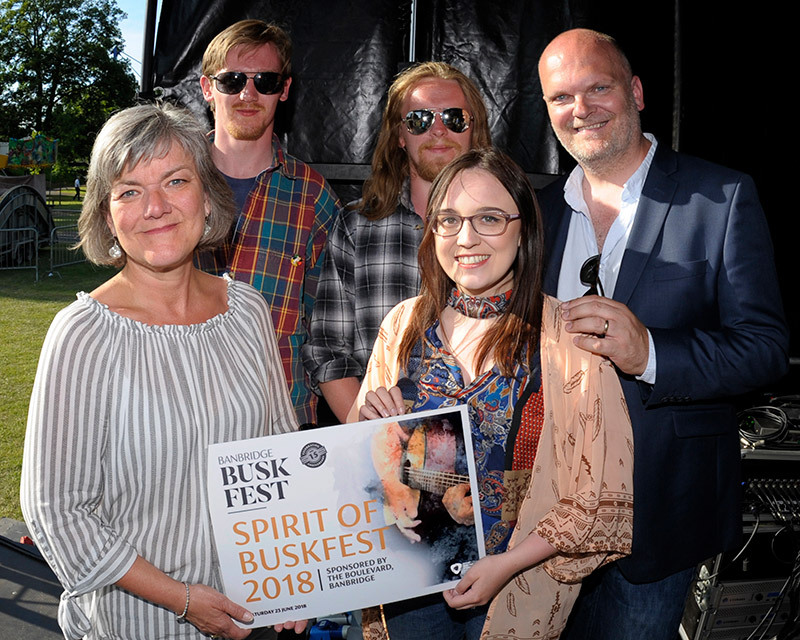 The Belfast Buskers, a recently formed four piece hailing from Portrush, Derrytrasna, Belfast and Randalstown picked up the £500 prize. Croga, a young five piece traditional folk band hailing from Co. Mayo were awarded £500. Sins of a Cynic, a Lurgan based trio who are regulars at BuskFest received the £250 prize sponsored by The Boulevard. 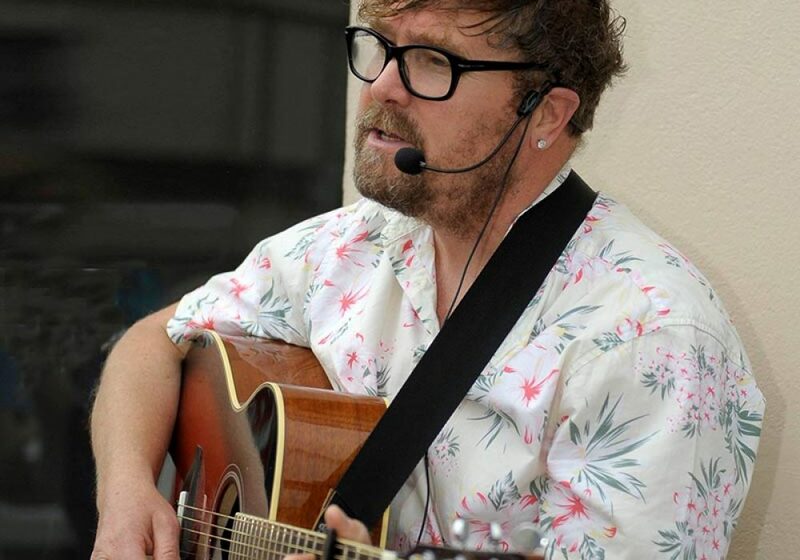 BuskFest is an international busking festival which takes place in Banbridge, County Down, Northern Ireland. The event comprises an outdoor daytime busking competition followed by a prize giving ceremony in Solitude Park. This flagship event is now entering its 14th year and attracts 6000+ people to Banbridge town centre. 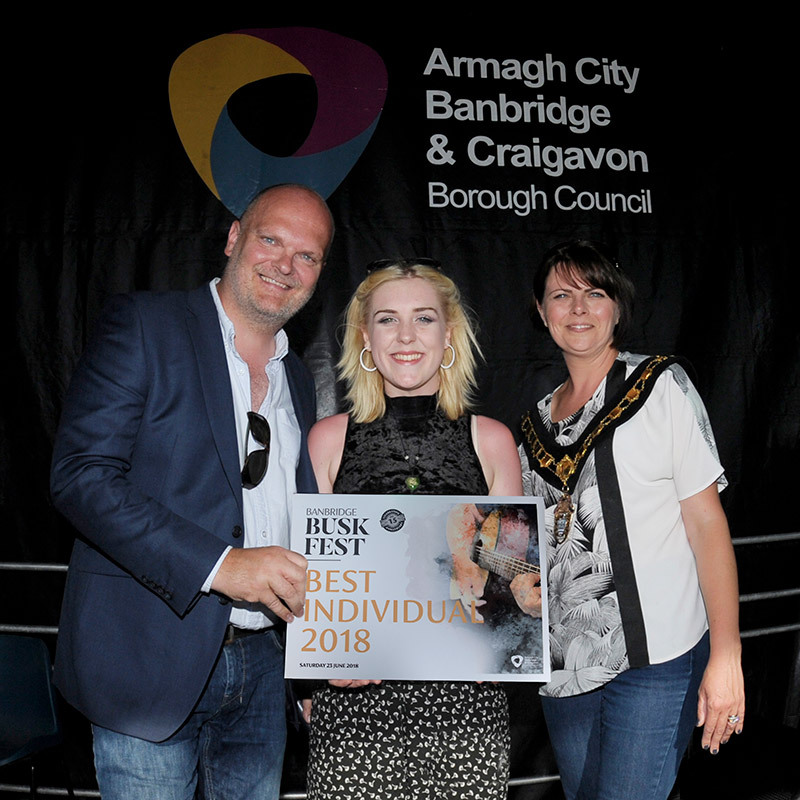 Every year the streets of Banbridge town centre are full to capacity with hundreds of musicians, singers, bands, solo artists and street performers from across the globe entertaining large family crowds in the hope of winning a prize from the £3000 cash pot. Ralph McLean BBC Radio Ulster, Buskfest Judge and compere. 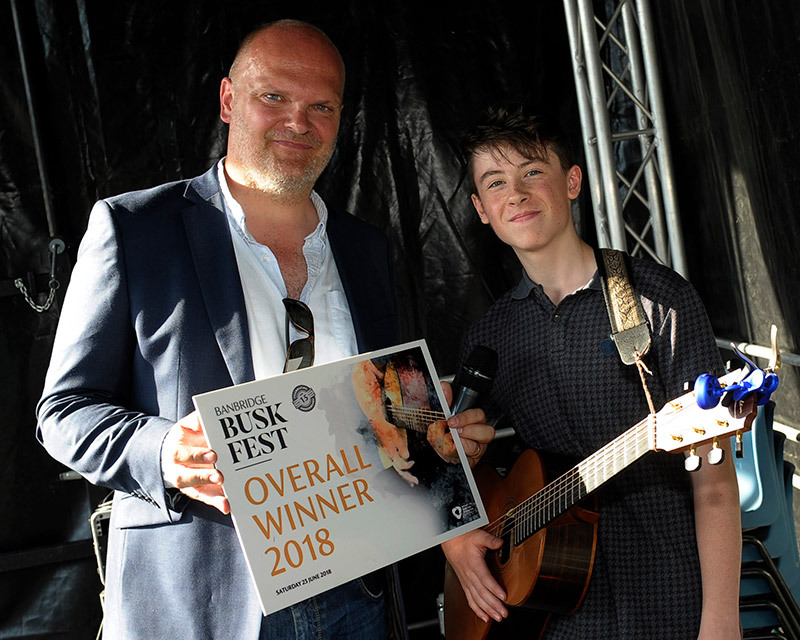 BuskFest showcases the wealth and diversity of musical talent and performing skills thriving from the local area and further afield. 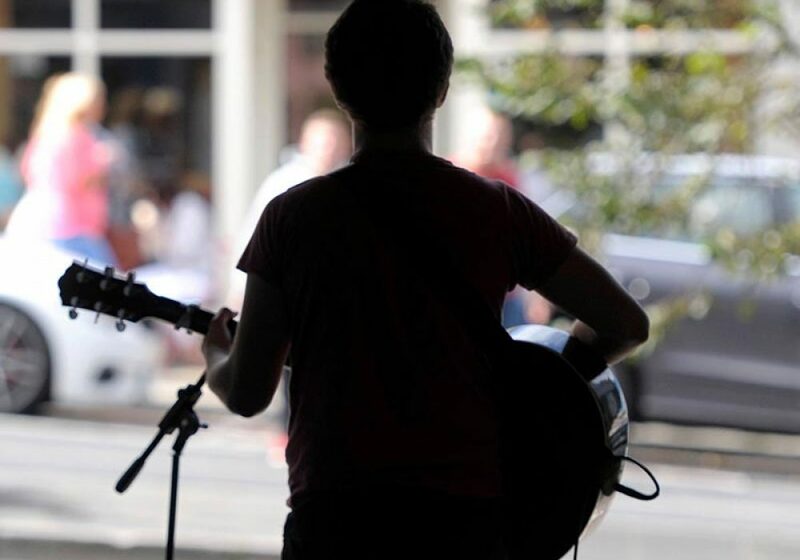 We aim to make BuskFest the leading busking festival in Ireland through our professional approach to the organisation of the event and by proactively seeking innovative ways of developing the event. 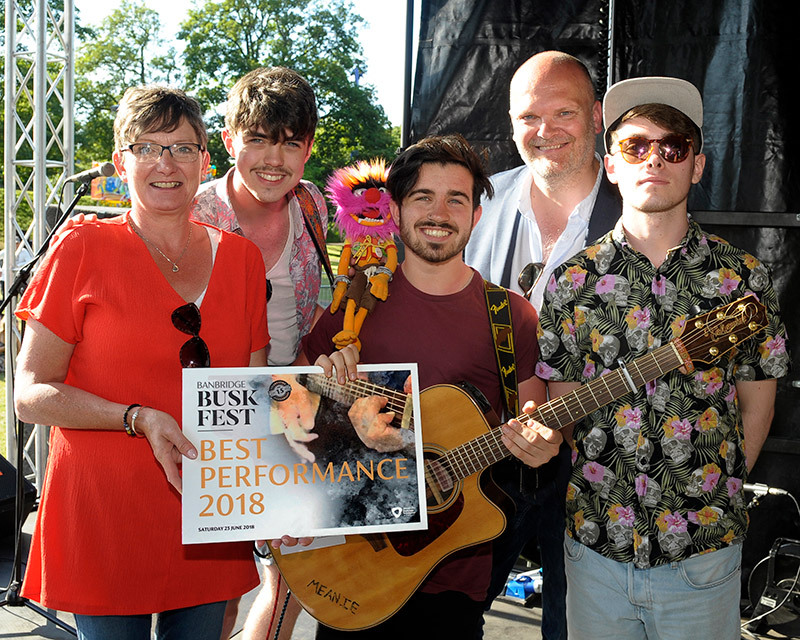 We work in partnership with all sectors of our local community to ensure that the BuskFest event remains fully inclusive to all. It couldn’t be easier to get to Banbridge, conveniently located just off the main A1 Belfast / Dublin route, 12 miles from Newry and 22 miles from Belfast. The town centre is easily accessible by car and public transport from Northern Ireland and the South of Ireland. 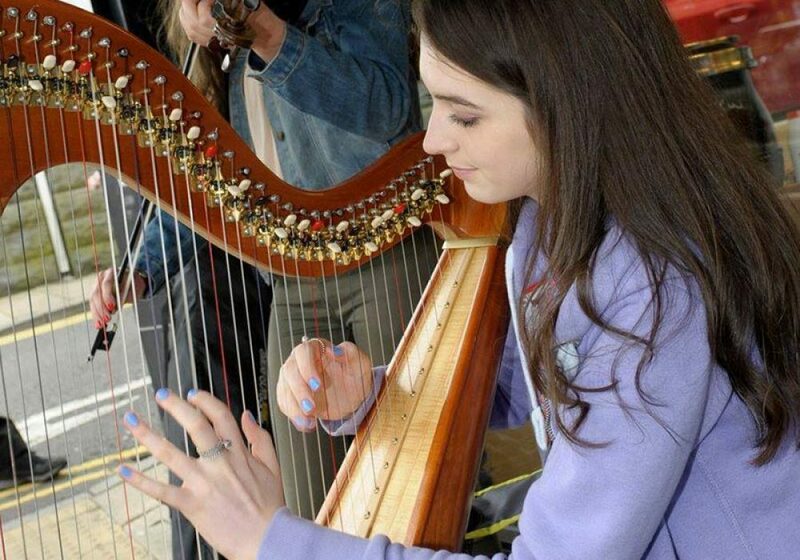 Banbridge’s annual busking festival will be held on Saturday 22nd June. Please note that all online registrants will still need to go to the Registration Point, Old Town Hall, Scarva Street, Banbridge, between 9.30am – 11.30am, on the day of the event in order to be allocated their pitch. 1. 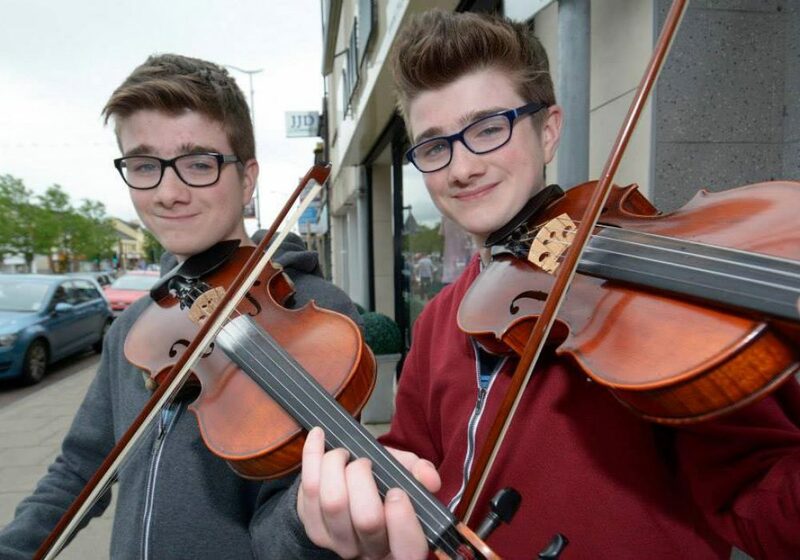 All performers must register at Banbridge Old Town Hall, Scarva Street, Banbridge between 9:30am – 11.30am on Saturday 22 June 2019. 2. Any performer arriving later than 11.30am will not be judged as part of the competition but may be allocated a pitch to perform, if available. 3. Children must be accompanied by an adult at the time of registration and throughout the event. 4. Competitors may enter the Junior competition only if the oldest performer in their group is 16 years of age or younger. 5. No act can be entered in both the Junior and Open competitions. 6. No act can enter either competition more than once. For example a competitor may not enter the competition as a soloist and then also enter the same competition as part of a group. 7. You are required to busk from 1.00pm until 4.30pm at your pitch. 8. The content of your act must not be in breach of any law or copyright and should adhere to the rules of common decency. 9. Any act that the judges deem to be dangerous, offensive or otherwise inappropriate will be asked to stop and will be withdrawn from the competition. 10. No mains powered amplification is allowed. The judges may ask buskers using battery-powered amplification to turn down their volume. 11. No pre recorded backing tracks are permitted. 12. You may not be aware that you are being judged as this will be done anonymously at different times throughout the afternoon. 13. The judges decision is final. No discussion will be entered into. 14. All competitors must be at the Prize Giving Ceremony, Solitude Park Banbridge at 4.30pm to take part in the prize giving event. 15. The Winners may be invited to perform on stage so please ensure that you have your instrument(s) with you. 16. All Junior performers must be accompanied by an adult to allow the prize winning cheque to be issued. 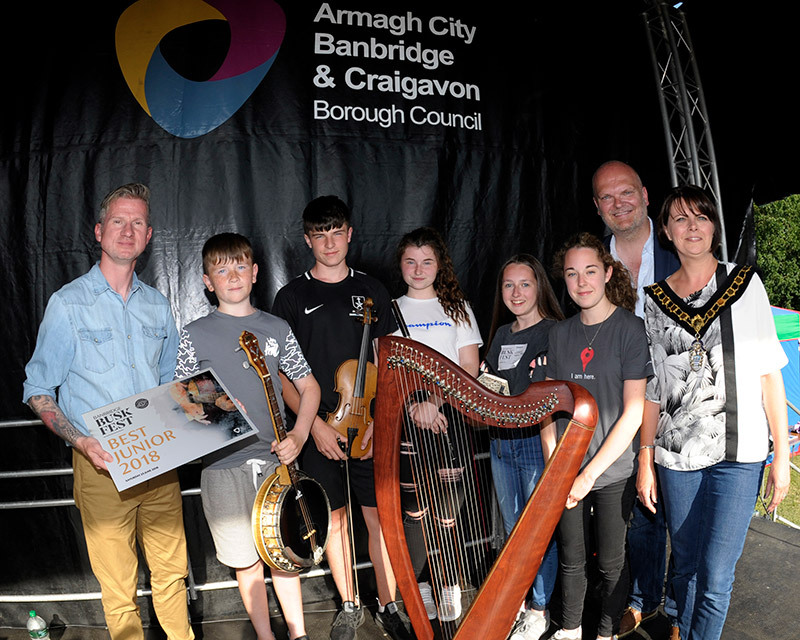 This year’s festival will take place on Saturday 22 June 2019 in Banbridge town centre. There is a panel of judges who will individually judge buskers at their pitches. We want to see you perform naturally and how you entertain the public so you may not know when you have been judged and it may be on more than one occasion throughout the afternoon. Each judge will shortlist their favourite performers and the judging panel will re-visit each one to select the finalists. At this stage you may or may not be told you are being judged. Skill in your chosen instrument, voice or performance. Do you enjoy performing? If so that will clearly come across. Pick songs that you know, that suit your voice or style or that you simply enjoy. mistake. Your performance is what makes BuskFest a success – never forget that! To err is human so if you falter, forget the words or drop your juggling balls, just carry on. Show off your personality and remember to just be yourself. Be friendly, polite and show your sense of humour. The following guidelines have been prepared to help you to have a safe and enjoyable day. * Remain at your allocated pitch for the duration of the competition, unless instructed otherwise by an event official. * Use plastic or tin drink containers – Glass is Not Permitted. * All rubbish should be disposed of safely in waste bins. * Ensure that cases, instruments or other pieces of equipment do not become an obstruction or trip hazard. * Only battery powered amplification is permitted. Respect your fellow performers by keeping the volume at a level which is safe and acceptable to event officials. * Be aware that Banbridge Town Centre will remain open to traffic for the duration of the event. * Dress appropriately and protect yourself against all kinds of weather which could be changeable throughout the day. * First Aid Units will be located in the town centre. * In an emergency contact the nearest steward. Alternatively make your way to the Control Point. For publicity purposes, photographs will be taken throughout the day of the event. 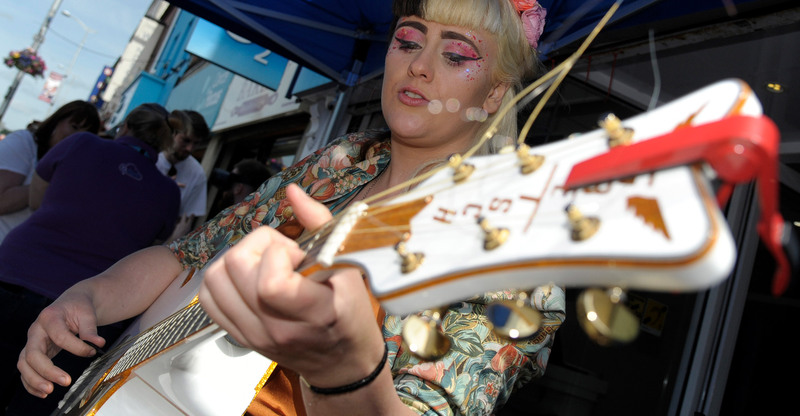 All buskers will be required to sign a consent form when receiving their pitch allocation and under 18’s will require parent/guardian consent. * Event Stewards will be on duty throughout Buskfest and will be wearing highly visible jackets. * Report anything suspicious or inappropriate to the nearest Event Steward. Health and Safety is the responsibility of everyone, please ensure that your own actions promote a safe and enjoyable day for all those taking part. 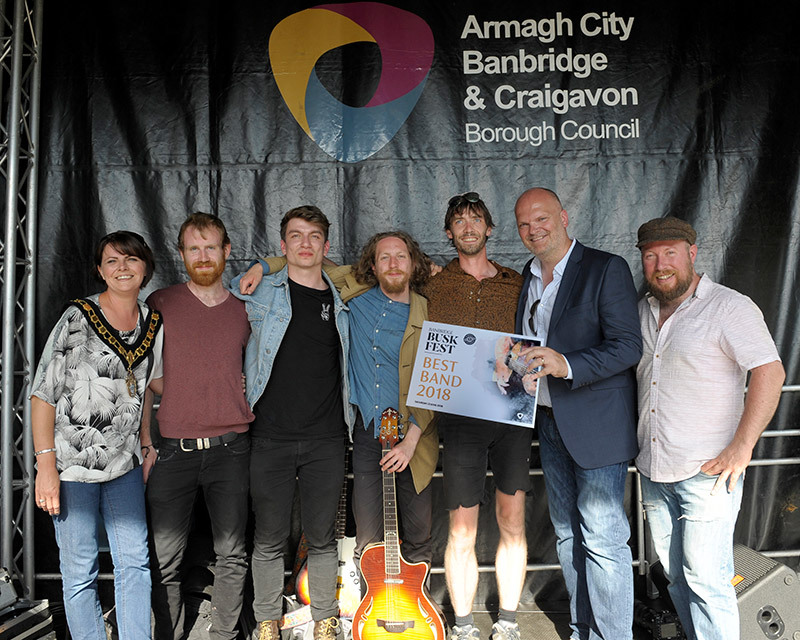 The Arts & Events Service Banbridge is part of Armagh City, Banbridge & Craigavon Borough Council (ACBCBC). Due to the nature of this service, we collect data across a number of different areas. Some of these will not apply to everyone but it is important that we inform you of all data we collect. When you purchase tickets or book classes through the reception at the F.E. McWilliam Gallery or Old Town Hall, your name, address, email and phone number(s) will be stored by our ticketing partner Ticketsolve. If you pay for your tickets by credit or debit card, data is shared between F.E. McWilliam Gallery, Old Town Hall, Ticketsolve and the payment system Realex. This enables the transaction to be processed. Realex have been accredited with the Account Information Security (AIS) certification by VISA and are one of a small amount of companies in Europe to achieve this. This shows its commitment to above industry standard in every aspect of payment processing. Realex Payments are compliant with PCI DSS Version 3.2, the highest level of PCI compliance. Cardholder information is encrypted and hashed when stored on Realex Payments systems and is not be displayed in their reporting systems. When you purchase tickets or book classes/workshops at the reception or over the telephone by credit card we process your payment via worldpay. To view their privacy statement please go to https://www.worldpay.com/uk/privacy-policy . We do not retain your credit card details. You have the right to opt out of any communications, or to ask that your details be removed from any or all of our databases, at any time – please click the link in any email, call us, or email leah.duncan@armaghbanbridgecraigavon.gov.uk / Danielle.fegan@armaghbanbridgecraigavon.gov.uk to update your preferences. When you book tickets online, data is shared between F.E. McWilliam Gallery, Old Town Hall, Ticketsolve and the payment system Realex. If you have opted in to receive marketing information from Arts & Events, data will be shared with MailChimp (our email partner). Ticketsolve acts as a data processor on behalf of the F.E. McWilliam Gallery and Old Town Hall (the data controller). Ticketsolve, Realex, MailChimp and the Arts & Events have implemented appropriate technological measures to protect against accidental loss, destruction, damage, alteration or disclosure. When someone visits our website – www.visitarmagh.com we use a number of third party services to collect standard internet log information and details of visitor behaviour patterns. We do this to find out things such as the number of visitors to the various parts of the site, types of elements used, and length of time on pages. There cookies are used to collect information about how visitors use our website. We use the information to compile reports and to help us improve the website. The cookies collect in an anonymous form, including the number of visitors to the website, device used, where visitors have come to the website from and the pages they visit on the website. You can prevent the setting of cookies by adjusting the settings on your browser. Please be aware that disabling cookies may affect the functionality of our website and many other websites that you may visit. Disabling cookies may result in the removal of certain functionality and other features of our website. When you sign up for the Arts & Events mailing list, either at the time of booking, or separately through a sign-up form, via phone, email or other means, we collect personal information. We use that information in the following ways: to share information such as upcoming events; to contact you if we need to obtain or provide additional information to check our records are correct and to check, on occasion, that you’re content and satisfied with our service. We also gather statistics around email opening and clicks using industry standard technologies to help us monitor and improve our marketing. All our email marketing will include an unsubscribe link and you can also unsubscribe at any time by emailing our data controllers Leah Duncan and Danielle Fegan. Please be aware that even if you have opted out of receiving marketing materials, Arts & Events may need to contact you (for instance in the event of a cancelled event). On occasion, parental consent forms are required for people under 18 taking part in activities in the F.E. McWilliam Gallery & Studio and Old Town Hall. This information will include name, address, phone number & email address of the person with parental responsibility. It may also include the name of the child, specific permissions (e.g. photography, permission to leave during breaks, allergy or medical conditions). These consent forms will be stored appropriately and will be disposed of upon the completion of the project. In accordance with GDPR, Arts & Events will not hold your data longer than is necessary for the purpose, or purposes, for which it was obtained. If you wish to contact the BuskFest team please email info@buskfest.com and a member of the team will get back to you.